The Business have been doing some digging in the official statistics and the above quote is taken from the leader in the latest edition of the magazine. 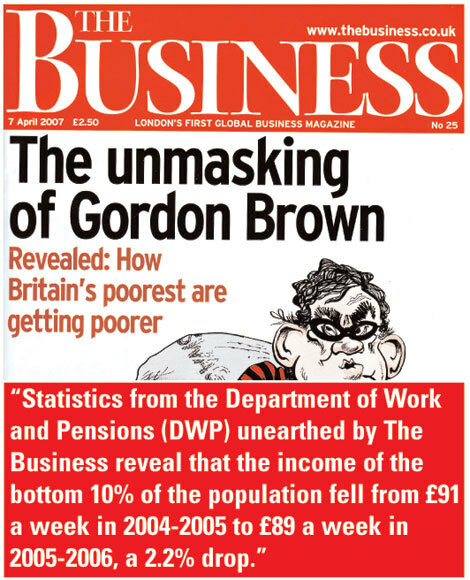 It's quite an achievement for Mr Brown to have combined deeper poverty with the highest tax burden in British history... and tragic for the most vulnerable members of our society. 1. A policy of mass immigration which forces down the price of low-skilled/ unskilled labour (even Polly Toynbee now recognises this). 2. An education policy which mass-produces mediocrity at vast expense, leaving our workforce ever less well-equipped to cope. 3. A policy on crime which is lax and leaves the poor especially exposed to thieves and muggers. 4. A credit boom which has made housing unaffordable for ordinary people. 5. A tax credit policy which traps people on benefits. 6. A policy on families which encourages family breakdown and single parenthood, all of which lead to higher levels of poverty. However, don't expect any significant improvement under the Tories. I think Mike McGowan has pretty much got it (though I obviously wouldn't agree with his last comment). The welfare state is just a bottomless pit, from where poverty and idleness feed and thrive. It needs tackling before any of the other problems that McGowan points out. I think Mike McGowen has got it completely right. I'm afraid I don't think the camaroons will make a much better job ( a worse job would be nigh on impossible). Superb first post from Michael McGowan. May I just add that Nulab WANT things to be this way? That way they can shout about "relative poverty" and justify ever higher and more complicated benefits (with armies of advisors and administrators, all captive Nulan voters) to be funded by ever higher taxes on everything and everybody. Shugmeister, of course things can and will get worse, just you wait until tax year 08-09 when tax burden on lower earners jumps yet again, to be patched over with yet more Tax Credits, which will be withdrawn at an even higher rate (39%). I'm not normally redistributist by nature, but I would happily "volunteer" the salary of Polly Townbee and her editor to be redeployed amongst the huddled masses to help alleviate any short-term problems they may be having accessing those fantastically straight-forward, means-testing, poverty-trapping tax credits so beloved of the Great Clunking Failure, sorry Fist. I agree. Great comment from MMcG... apart from last line where I'm more hopeful (partly because of the deep policy work that I know IDS is doing). This is what happens when Government policy is founded on ideology rather than pragmatism. This is one of the key differences between a Labour and Cameron lead Conservative Government, and I'm surprised that many on this thread don't recognise that. I don't think that there is any point attempting to eliminate poverty. Provide benefit at minimal levels as much as possible on a universal basis, good infrastructure and transport links, focusing on boosting R&D, strong Criminal Justice policies including Capital Punishment and a rejection of liberalism and focusing on a strong economy will benefit poor people as it will benefit most people. Beyond that there is no point collecting statistics on poverty and having millions of studies, best to do what is in the national interest and leave it at that. Migrant workers get things done that either the local population wouldn't do or would not do at a level that would be economically viable in a global economy, they are among the hardest workers in this country and benefit this economy and through money sent home the economies of their countries of origin - the answer is de-regulation including scrapping Minimum Wage legislation and regulation on working hours and holidays, and weakening the Trade Unions. Tim, where did you get the Osborne comment from? He probably texts Tim to check his press releases first, Oberon! "or would not do at a level that would be economically viable in a global economy"
Which means they will accept being paid less, which forces down the price of low-skilled/ unskilled labour, which makes the poor poorer. If you pay people not to work then that's what they'll do. If you pay people to be poor, then that's what they'll be. Human nature is a powerful force. They press released it just after 2pm, Oberon. than the Department of Work and Pensions' own Tax and Benefit Model Tables. The income, after tax and before housing costs, of a typical childless twin-earner couple (the husband earns £25,000 and the wife £15,000) falls by nearly £200 per week if the wife gives up work to stay at home with two children. A single woman on the same salary has a post-tax income of £230 per week and is not entitled to any benefits. If she becomes an unemployed lone parent with two children, her household's total benefit income, before housing costs, increases to nearly £250. The Tax and Benefit Model Tables also show why "it is easier for couple-families to escape poverty". Is it any surprise that over eighty per cent of married mothers whose children are of school age are in work, as opposed to under sixty per cent of lone parents? "the answer is de-regulation including scrapping Minimum Wage legislation and regulation on working hours and holidays, and weakening the Trade Unions"
Unfortunately I doubt the electorate could stomach it. Freedom of contract is now rated less highly than freedom of the busybody state. In the short term in the country in which it is happening, if the global economy grows as a result then there are fewer poor people overall, over time greater economic growth within this country would mean that although relative poverty as defined would increase, actual destitution and absolute poverty would decline. 1. At a meeting with Byers et. Al, Brown gave the go-ahead to force Railtrack into liquidation, and set this in motion by refusing to release the £1.5bn to Railtrack to keep the company solvent. He was the man behind Byers. This foolish decision would cost the taxpayer over £2 billion in compensation to city institutions, individual invertors lost the lot. 2. Brown was the man that came up with the targets system for the NHS in return for extra funding. As we all know this was an awful strategy and hundreds of billions of pounds went down the drain as a result. 3. Despite his criticism of the Conservative handling of the ERM fiasco, he is lying. He is on the public record of endorsing the policy at the time, and even talked against devaluing. He also was pro-euro, until Murdoch threatened both Brown and Blair with a mauling if they tried to join. 4. It was Brown that forced through the Independent Learning Accounts (ILA). This scheme was subject to massive fraud, but Brown forced David Normington, the permanent secretary to keep the scheme open, and later forced Estelle Morris to continue operating the scheme and it was only after £100 million was fraudulently claimed was it halted. 5. Brown devised the policy of means testing middle class couples, which encouraged then not to get married for purely financial reasons. 6. Brown it was that, against professional advice, encouraged mothers of very young children to out them into day care and work instead of staying with them at home during a crucial period for building parental bonds. Brown it was that devised the childcare credit system, which has a 47 page instruction form and 12 page application form. This system was stopped due to massive fraud. 7. Brown must take the lions share of the blame for benefit fraud has rising by £10billion since he took office. The proposed solution, typical Labour police state tactics, install lie detectors. 8. Despite his boasts on poverty action, the chaotic failures of the tax credit system Brown devised have put more children into poverty than any other. 9. Brown was the man that found a way to increase spending without immediate taxation using the PFI initiative. This flawed and inefficient scheme allows him to commit to huge spending programs that he doesn’t need to balance in his budget. Future Governments will however. I could go on and on and on. This man is a walking target, and now is the time to strike again and again and again. Oh go on Oberon, finish off the list. It won't take you more than a few days and will be a useful checklist. Please include replacing RPI with CPI. There is just one comment above which suggests this suits Labour. I suggest we do not take this attitude seriously enough. It is in Labour's interest to have children AND pensioners etc poor. Poor people vote Labour. I don't propose that Brown has a deliberate policy to make these people poorer but decisions have to make their way through numbers of various types of people. Given the number of Labour supporters within the Civil Service it is probable that, at different levels, the risks that people would be poorer were not seen as something to be avoided at all costs given other issues and problems. As a simpler example; I don't suppose Livingstone had a deliberate policy of replacing Routmasters with "bendy" buses but with all his friends in County Hall handling these decisions the idea of replacing a British icon with something that clogs traffic more wouldn't be seen as a particularly bad idea when wrestling with options and complications. And Oberon has forgotten selling gold to buy Euros. Oh and lets not for get the flooding of the country with cheap labour who are contributing to the vast numbers caught in the welfare trap. These migrants are now actively being signed up to unions, the NuLab only source of funding, and will undoubtedly be offered an amnesty before the next election allowing them to vote NuLab. Its is so transparent i want to cry. That is why they are suppressing the real numbers of migrants, by not counting them. Some rural towns, natural Tory targets, are seeing upwards of 10-20% population increases. These people cana lready vote in welsh and scottish assembly elections and all local elections. The electoral register is mushrooming with a 400,000 increase in the last year. Why the Tory Party cannot see the deliberate social engineering going on amazes me. These migrants are suppressing wages and increasing the "depend on NuLab" welfare trap vote, contributing to NuLab coffers and we are all prevented from discussing it by Guardinista liberal crying "racist". How much of a swing do the Tory candidates need if they are required to win over the hidden, but growing, voters who will ojnly ever vote NuLab. Our policies are timid and will be exposed by the shameful lies of yhis government. The woman in charge of migration cannot even answer the question "estimate how many migrants are in the country?" Why cant she answer this question? Because they make no attempt to try and count them. This has nothing to do with racism or migrants per se but is simply a blatantcorrupting of the electoral register. Any amnesty near e;ection time would add another 1-2 million NuLab voters and destroy Tory hopes of a working majority because these people are ALL based in England. When Gordo announces the amnesty and allows them to vote "merely to bring England into line with Scotland and Wales" you will know the election is 9 months away. The BBC are helpin to supress debate on the subject with fake stories on this issue as Times story on Rumanians seen in the Times. It may not be a palatable subject but it must be addressed or the Tory Party have a bigger hill to climb than they quite understand. A Labour Govt that has made the poor poorer is surely the true legacy of Blairism and NuLab. What a shame though that all three major parties are now signed up to the "the middle classes are all that counts anymore" theory. I do hope that Tim is correct and that IDS' policy group will give us some genuinely innovative and vote winning policies to help the poorest, but I'm not counting on the Old Etonians to be willing to turn these into firm manifesto commitments unfortunately. Doesn't Gordon Brown prove that the only wealth socialism creates is for the socialist oligarchs who control the system? I think Michael McGowan has hit the nail on the head. Michael, the policy of ’mass immigration’ has benefited Britain in many ways, having a hard working, low cost unskilled labour base is no bad thing, this isn’t the reason for the lowering in the outlook of the poor. I also dispute your comments regarding Education, whilst I believe it could be much better under a Tory Government, there are many kids that work extremely hard, get great A-levels and excellent degrees. I am in charge of graduate recruitment at my company, and am continually impressed with the quality of grads I see. Better surely to target the failure of Labour to encourage vocational options for less academic school leavers. Their arrogant view that everyone should go to university is the real reason for the exclusion less academically minded but talented school leavers from the opportunity of pursuing a great career. The Conservatives should throw their weight behind this. Regarding muggers, not sure this is high on the list of causes, symptoms possibly. Doubt most people would think low interest rates and cheap credit were a bad thing, barking up the wrong tree here, although I agree action needs to be taken now to avoid a climb in rates in the future, but the BoE seem to be handling that well so far. Finally, I agree that Labour’s policies the family is a serious cause of this malaise, but this will take time to reverse as it’s a long term issue, but one we are committed to already. Finally, your comment “Don’t expect anything different from the Tories” is nonsense, why don’t you take the time to look at where our policy development is going with this instead of blindly rubbishing things. Its a lot easier to treat politics as a spectator sport mate, but getting elected and making the difference is more important than throwing stones. Try contributing for a change, you might find that much more rewarding. and am continually impressed with the quality of grads I see. On what criteria and by what yardstick ? No ever since Edward Heath deregulated credit in 1971 Britain has enjoyed inflationary booms to compensate for low productivity and stagnating real incomes. Credit is the answer to relative decline in the US and Britain, and the reason China, Taiwan, Korea, Japan build new factories to meet British excess demand. By advocating stringent controls on this you are talking like a command and control socialist solution. Millions of people benefiting from this situation are going to be denied the opportunity to own homes just to protect those that abuse the priviledge. No this is not an avenue that bears fruit. Now, the yardstick I judge our graduates by is that they consistently out-perform those we hire from other major countries, including France, Spain and the USA. They tend to develop opportunities better, have more original thinking, can see the wider picture better, have more businrss acumen, communicate better, work harder and get promoted to senior positions younger. Now look, too often on these threads the doom mongers prevail. By exaduration and distorting the situation, the solitions are distorted and exagerated, one of the biggest mistakes we have falled into in opposition. By talking like this we really scare people, including myself. Its time to look at things more objectively. There are more home owners in britain than ever before. Home ownership is going into reverse. Docheck the statistics Oberon. By advocating stringent controls on this you are talking like a command and control socialist solution. Well Oberon Central Banking IS Command & Control. That is the whole point of Monetary Base Control. That is how the Federal Reserve, ECB, and BoE are supposed to function. They are supposed to preserve the value of money and not to cause asset-price inflation. Home ownership has been rising in the UK for 68 years, and was at its most rapid during Thatchers term in government (right to buy etc.). The "dip" you refer to happened in the last week, too short a time to be considered a trend, although I accept that high housing prices are a concern just now, but many have benefited greatly from this. I don't believe this has a material bearing on this thread. Regarding central banking, the implication from you and Michael is that this has led to the poor getting poorer, something that I don't believe is materially significant, or that the system is broken. Low interest rates are a good thing, and advocating the manipulation of them to stop people borrowing is tantamount to stopping folks plan for the future themselves. Low interest rates are a good thing, and advocating the manipulation of them to stop people borrowing is tantamount to stopping folks plan for the future themselves. On the other hand you can get interest rates low by expanding money supply - short-term manipulation of IS-LM but in the end interest rates must rise to choke off credit expansion. Thatcher did it by overfunding using Gilts which is why Lawson had to join the ERM to try to stabilise the exchange rate. Tomtom, you are bambooziling us with economic nonsense speak. Are you Gordons Child? 1% of blokes between 1997 and 2004 yielding 0.5% above BoE bonds devalued by increasing interest rate prudence, but offest by tigger and poo bear. This proves that Gordon Brown is in-fact Flash Gordon in Tin foil pants... or are you just Googling the LSE website? Apologies for the last childish post Tomtom,I mustn't post after returning from the pub!